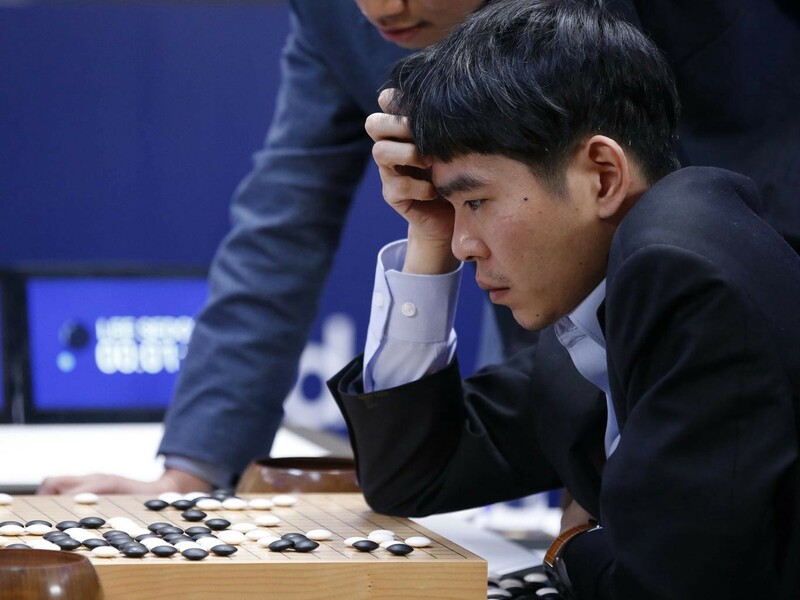 The language is a new class of machine learning known as deep learning, and the “whispered word” was a computer’s use of it to seemingly out of nowhere defeat three-time European Go champion Fan Hui, not once but five times in a row without defeat. Many who read this news, considered that as impressive, but in no way comparable to a match against Lee Se-dol instead, who many consider to be one of the world’s best living Go players, if not the best. Imagining such a grand duel of man versus machine, China’s top Go player predicted that Lee would not lose a single game, and Lee himself confidently expected to possibly lose one at the most. One of these applications is the creation of deep neural networks - kind of like pared-down virtual brains. They provide an avenue to machine learning that’s made incredible leaps that were previously thought to be much further down the road, if even possible at all. How? It’s not just the obvious growing capability of our computers and our expanding knowledge in the neurosciences, but the vastly growing expanse of our collective data, aka big data. The power of deep learning is that it’s a way of using massive amounts of data to get machines to operate more like we do without giving them explicit instructions. Instead of describing “chairness” to a computer, we instead just plug it into the Internet and feed it millions of pictures of chairs. It can then have a general idea of “chairness.” Next we test it with even more images. Where it’s wrong, we correct it, which further improves its “chairness” detection. Repetition of this process results in a computer that knows what a chair is when it sees it, for the most part as well as we can. The important difference though is that unlike us, it can then sort through millions of images within a matter of seconds. The future is a place of accelerating changes. It seems unwise to continue looking at the future as if it were the past, where just because new jobs have historically appeared, they always will. The WEF started 2016 off by estimating the creation by 2020 of 2 million new jobs alongside the elimination of 7 million. That’s a net loss, not a net gain of 5 million jobs. In a frequently cited paper, an Oxford study estimated the automation of about half of all existing jobs by 2033. 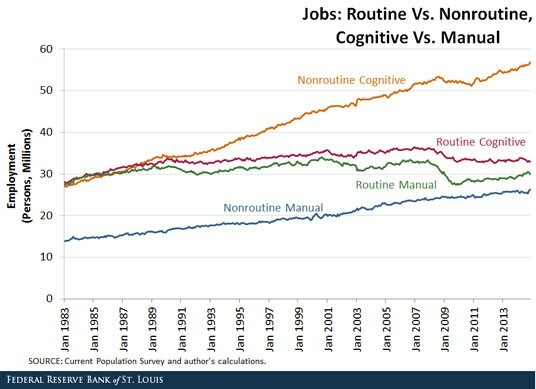 Meanwhile self-driving vehicles, again thanks to machine learning, have the capability of drastically impacting all economies — especially the US economy as I wrote last year about automating truck driving — by eliminating millions of jobs within a short span of time. And now even the White House, in a stunning report to Congress, has put the probability at 83 percent that a worker making less than $20 an hour in 2010 will eventually lose their job to a machine. Even workers making as much as $40 an hour face odds of 31 percent. To ignore odds like these is tantamount to our now laughable “duck and cover” strategies for avoiding nuclear blasts during the Cold War. When those building the tools begin warning about the implications of their use, shouldn’t those wishing to use those tools listen with the utmost attention, especially when it’s the very livelihoods of millions of people at stake? If not then, what about when Nobel prize winning economists begin agreeing with them in increasing numbers? No nation is yet ready for the changes ahead. High labor force non-participation leads to social instability, and a lack of consumers within consumer economies leads to economic instability. So let’s ask ourselves, what’s the purpose of the technologies we’re creating? What’s the purpose of a car that can drive for us, or artificial intelligence that can shoulder 60% of our workload? Is it to allow us to work more hours for even less pay? Or is it to enable us to choose how we work, and to decline any pay/hours we deem insufficient because we’re already earning the incomes that machines aren’t? 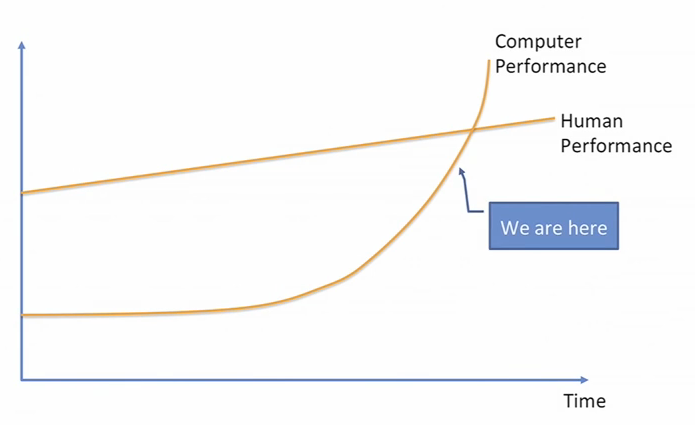 What’s the big lesson to learn, in a century when machines can learn? I offer it’s that jobs are for machines, and life is for people. This article was written on a crowdfunded monthly basic income. If you found value in this article, you can support it along with all my advocacy for basic income with a monthly patron pledge of $1+. Special thanks to Arjun Banker, Steven Grimm, Larry Cohen, Topher Hunt, Aaron Marcus-Kubitza, Andrew Stern, Keith Davis, Albert Wenger, Richard Just, Chris Smothers, Mark Witham, David Ihnen, Danielle Texeira, Katie Doemland, Paul Wicks, Jan Smole, Joe Esposito, Jack Wagner, Joe Ballou, Stuart Matthews, Natalie Foster, Chris McCoy, Michael Honey, Gary Aranovich, Kai Wong, John David Hodge, Louise Whitmore, Dan O’Sullivan, Harish Venkatesan, Michiel Dral, Gerald Huff, Susanne Berg, Cameron Ottens, Kian Alavi, Gray Scott, Kirk Israel, Robert Solovay, Jeff Schulman, Andrew Henderson, Robert F. Greene, Martin Jordo, Victor Lau, Shane Gordon, Paolo Narciso, Johan Grahn, Tony DeStefano, Erhan Altay, Bryan Herdliska, Stephane Boisvert, Dave Shelton, Rise & Shine PAC, Luke Sampson, Lee Irving, Kris Roadruck, Amy Shaffer, Thomas Welsh, Olli Niinimäki, Casey Young, Elizabeth Balcar, Masud Shah, Allen Bauer, all my other funders for their support, and my amazing partner, Katie Smith. Scott Santens writes about basic income on his blog. You can also follow him here on Medium, on Twitter, on Facebook, or on Reddit where he is a moderator for the /r/BasicIncome community of over 30,000 subscribers. If you feel others would appreciate this article, please click the green heart.